The cries of joy were deafening as people gathered in the streets. People ran around hugging and kissing strangers. In a sense, the news was totally unexpected. Japan had just surrendered. 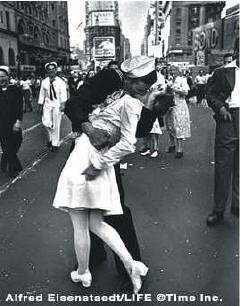 VJ Day, as it is now called, produced great celebration. Everyone was relieved that we would not have to endure a bloody invasion of Japan. We would not have to sacrifice 200,000 more men to end the war. During the war, millions of lives were put on hold. Now that the war is over, people could start living their lives again. "The misery is behind us," they would say. "We have won the war." In reality, though, there are no winners in war; only losers. Even the "winners" are actually losers. Both sides in any conflict suffer losses. The question is not who won the most, but who lost the least. The "winners" of WWII suffered staggering losses. Even the U.S., which did not have its own homeland ravaged by the war, suffered great losses. Besides the $360 billion price tag ($3,578 billion in today’s dollars), there were 292,131 Americans killed (not to mention the 115,185 "non-battle deaths"). There were also 670,846 Americans wounded. This, of course, does not take into account the emotional toll of shattered lives and marriages. Yes, we "won" because we survived the war declared on us by Japan and Germany. Yes, we "won" because we saved the world from plummeting into a very dark and desperate era. Yes, we "won" because we saved over 100 million people from certain death and several hundred million people from oppression and torture. If Japan and Germany had not been defeated, the losses to America (and the rest of the world) would have been far more substantial. So, in comparison, we did "win." Don’t get me wrong; I’m not an anti-war protestor. I feel there is a definite need for a strong national defense. I feel it is important for our country to be able to defend herself. I also believe that there is the unfortunate need for the U.S. to defend the oppressed and defenseless of the world. Although I don’t like the U.S. being the guardian of the world, there is a moral obligation to protect the defenseless when there is wholesale genocide and torture taking place. Of course, history has shown us there is a right way and a wrong way to intervene in foreign problems. The reason I bring this up is because we all have our own private "wars." These wars may be with our mates, parents, neighbors, co-workers, fellow church members, etc. Although some wars are unavoidable, most can and should be avoided. So many of these wars are fought over petty, insignificant issues. Just as there are no true winners in military wars, there are no true winners in relationship wars. Both sides in any relationship war will suffer losses. A person may have "won" in a relationship war, but at what cost? 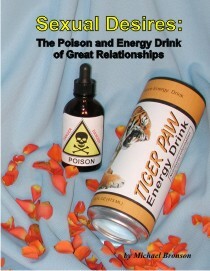 The damage he may have done to his marriage or friendship may be far greater than the value of the issue he fought for. It is so easy to lose more than you gain. It is important to "count the cost" before you engage in a war (Lk. 14:25-33). Corrections Officers have to consider this principle when dealing with aggressive and unmanageable prisoners. Subduing violent and angry prisoners can be very dangerous. It is not uncommon for officers to sustain serious knee or back injuries in "takedowns." As a result, most prison systems only use these takedowns when nothing else works. Although some prisoners view the reluctance to use force as a weakness, who cares? The officers get the job done and they do it without seriously altering a fellow officer’s life. Although wars can be very costly, there is another dark side to it. It is called the Third Party Takeover. When two powerful countries engage in all-out war against each other, they usually deplete most of their resources. Their defenses are substantially weakened, and they are now vulnerable to attacks from even weak nations. As a result, a neighboring country can easily walk in and take over both countries. In essence, everything the two countries had fought for was in vain. They would have been better off to have "counted the cost" and found a resolution with which they could live. Sometimes this happens in our personal lives. It is easy to become so consumed and distracted by our own private wars that we become vulnerable to Satan’s attacks. Satan sits back and lets us do his work for him. After we deplete our defenses, he steps in. The next time a conflict arises, carefully consider all of your options. See if you can resolve the problem without going to "war." Look at your projected losses and count the cost to see if it is really worth going to war.